Plenary indulgence to all who shall assist at these Novenas every day, and who shall afterwards, either on the Feast-day itself, to which each Novena respectively has reference, or on some one day in its Octave, after Confession and Communion, pray to our Lord and to the Blessed Virgin according to the pious intention of the Sovereign Pontiff. Come, Holy Spirit, fill the hearts of Thy faithful, and kindle in them the fire of Thy love. V. Send forth Thy Spirit, and they shall be created. O God, who hast taught the hearts of Thy faithful people by the light of the Holy Spirit; grant us in the same Spirit to relish what is right, and evermore to rejoice in his holy comfort. Through Christ our Lord. R. Amen. PREPARATORY PRAYER FOR EVERY DAY OF THE NOVENA. Nine Ave Maria’s, one Gloria Patri, and the following Prayer. PRAYER FOR THE FIRST DAY. . Behold me at thy sacred feet, O Immaculate Virgin. I rejoice with thee, because from all eternity thou wast elected to be the Mother of the Eternal Word, and wast preserved stainless from the taint of original sin. 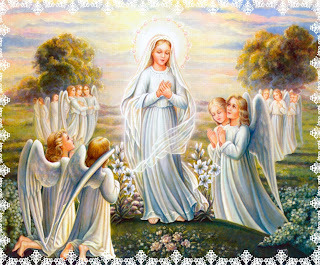 I praise and bless the Most Holy Trinity, who poured out upon thy soul in thy Conception the riches of that privilege. I humbly pray thee to obtain for me grace effectually to overcome the sad effects produced in my soul by original sin; make me wholly victorious over them, that I may never cease to love my God. V. All fair art thou, O Mary. R. All fair art thou, O Mary. V. The original stain is not in thee. R. The original stain is not in thee. R. Thou art the joy of Israel. V. Thou art the honour of our people. B. Intercede for us to our Lord Jesus Christ. V. In thy Conception, O Virgin, thou wast immaculate. R. Pray for us to the Father, whose Son was born of thee. O God, who through the Immaculate Conception of a Virgin didst prepare a worthy dwelling-place for Thy Son, we beseech Thee, who by the death of that Son, foreseen by Thee, didst preserve her from every stain of sin, to grant that by her intercession we also may be purified, and so may come to Thee. O God, the Shepherd and Ruler of all the faithful, graciously look down upon Thy servant N., whom Thou host chosen to be the pastor of Thy Church; and grant him, we beseech Thee, both by word and example, so to direct those over whom Thou hast placed him, that, together with the flock entrusted to his care, he may attain eternal life. O God, our refuge and strength, who art the author of all holiness, listen to the pious prayers of thy Church, and grant that what we ask in faith we may effectually obtain. Through Christ our Lord. Amen. The same order is to be observed en all the other days of the Novena, the Prayers for the Day alone being changed. PRAYER FOR THE SECOND DAY. Mary, unsullied Lily of purity, I rejoice with thee, because from the first moment of thy Conception thou wast filled with grace, and hadst given unto thee the perfect use of reason. I thank and I adore the Ever-blessed Trinity, who gave thee these high gifts. Behold me at thy feet overwhelmed with shame to see myself so poor in grace. O thou who wast filled full of heavenly grace, grant me a portion of that same grace, and make me a partaker in the treasures of thy Immaculate Conception. PRAYER FOR THE THIRD DAY. PRAYER FOR THE FOURTH DAY. Mary, Immaculate Virgin, Mirror of holy purity, I rejoice exceedingly to see how from thy Immaculate Conception there were infused into thy soul the most sublime and perfect virtues, with all the gifts of the Most Holy Spirit. I thank and praise the Ever-Blessed Trinity, who bestowed upon thee these high privileges, and I beseech thee, gracious Mother, obtain for me grace to practise every Christian virtue, and so to become worthy to receive the gifts and graces of the Holy Ghost. PRAYER FOR THE FIFTH DAY. Mary, bright Moon of purity, I congratulate thee in that the mystery of thy Immaculate Conception was the beginning of salvation to the human race, and was the joy of the whole world. I thank and bless the Ever-blessed Trinity, who did so magnify and glorify thy Person. I entreat thee to obtain for me the grace so to profit by the Death and Passion of thy dear Son, that His Precious Blood may not have been shed upon the cross for me in vain, but that after a holy life I may be saved. PRAYER FOR THE SIXTH DAY. Mary Immaculate, brilliant Star of purity, I rejoice with thee, because thy Immaculate Conception brought exceeding joy to all the angels in Paradise. I thank and bless the Ever-blessed Trinity, who enriched thee with this privilege. Enable me also one day to take part in this heavenly joy, praising and blessing thee in the company of angels world without end. Amen. PRAYER FOR THE SEVENTH DAY. Mary immaculate, rising Morn of purity, I rejoice with thee, and I am filled with admiration at beholding thee confirmed in grace and rendered sinless from the first moment of thy Conception. I thank and praise the Ever-blessed Trinity, who elected thee alone from all mankind for this especial privilege. Holiest Virgin, obtain for me an entire and lasting hatred of sin, as the worst of all evils, that I may rather die than ever again commit a mortal sin. PRAYER FOR THE EIGHTH DAY..
Mary, Virgin, Sun without stain, I congratulate thee, and I rejoice with thee, because God gave unto thee in thy Conception a greater and a more abundant grace than He gave to all His angels and His saints together, even when their merits were most exalted. I thank and admire the immense beneficence of the Ever-blessed Trinity, who hath dispensed to thee alone this privilege. O, enable me too to correspond with the grace of God, and never more to receive it in vain; change my heart, and help me to begin in earnest a new life. PRAYER FOR THE NINTH DAY. Immaculate Mary, living Light of holiness, Model of purity, Virgin and Mother, as soon as thou wast conceived thou didst profoundly adore thy God, giving Him thanks, because by means of thee the ancient curse was blotted out, and blessing was again come upon the sinful sons of Adam. Let this blessing kindle in my heart love towards God; and do thou inflame my heart still more and more, that I may ever love Him more constantly, and afterwards eternally enjoy Him in heaven, there to thank and praise Him more and more fervently for all the wondrous privileges conferred on thee, and to rejoice with thee for thy high crown of glory.